Yesterday was the UK’s final “Orange Wednesday”. If you don’t live in the UK, or have been living under a rock, here’s a bit of background. Introduced in 2003 by the mobile phone company Orange which later merged with T-Mobile to become EE, Orange Wednesdays ran a campaign with selected UK cinemas where customers could claim a 2 for 1 ticket offer by sending a text message. 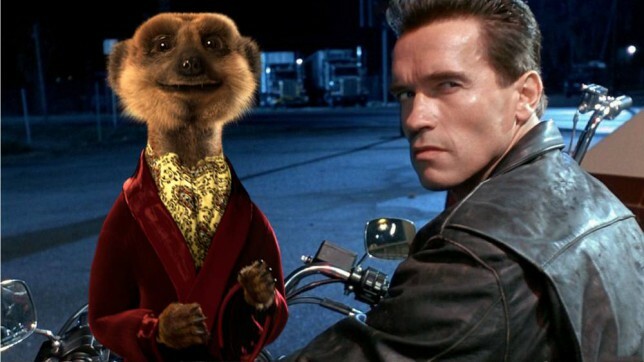 Then in February, reports emerged that former “Terminator” star and California Governer, Arnold Schwarzenegger would be joining Compare the Market’s famous Meerkats in a new advertising campaign – this has yet to be confirmed. Then last night, on the very last Orange Wednesday, cinema goers on Twitter reported seeing a teaser during the adverts, by the now famous Meerkats, using the hashtag #MeerkatMovies. Here are a couple we found today. Now that Orange Wednesdays are over, we’ll keep our ear to the ground, and let you know if we hear anything else about the replacement for the Orange 2 for 1 offer. Sign up for our newsletter and we’ll bring you all the latest cinema news, plus we’ll automatically enter you into our competition to win cinema tickets! What have you got to lose? This entry was posted in Uncategorized and tagged Cinema Tickets, Orange Wednesdays by MovieGlu. Bookmark the permalink.